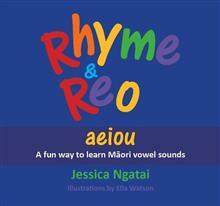 Celebrating te reo Maori, one of the official languages of Aotearoa soon to be released Rhyme & Reo: aeiou. This book aims to help teachers, parents and children to learn and have fun with te reo Maori. Passionate about te reo Maori, author Jessica Ngatai says: "I love ... read full description below. This book aims to help parents, teachers, and children to learn and have fun with te reo Maori. Passionate about te reo Maori, author Jessica Ngatai says: "I love to hear people giving te reo a go. I meet lots of people who are really keen to learn and speak te reo, but haven't had the opportunity to learn the basics, or lack the confidence to try at all." Rhyme & Reo will help people build confidence to use and enjoy te reo with their children and whanau. This delightfully illustrated book features quirky Kiwi poems, which weaves reo through the English text, with explanatory notes on the pronunciation of the vowel sounds appearing on a side-bar on each page. These fun rhymes are designed to help readers learn the correct pronunciation of the basic vowel sounds used in te reo Maori. Getting these five basic sounds right will enable readers to try any Maori word with confidence. Jessica Ngatai - Ngatiwai, Ngati Maniapoto, Ngati Pakeha. Jessica holds degrees in Law and Maori Studies and has worked for over 10 years in the field of human rights. Becoming an Aunty to three nieces has reignited an interest in early childhood learning and development, prompting her to venture into writing for children. Jessica has contributed to Ngatiwai educational resources for early childhood education and primary schools. Jessica lives in Auckland.